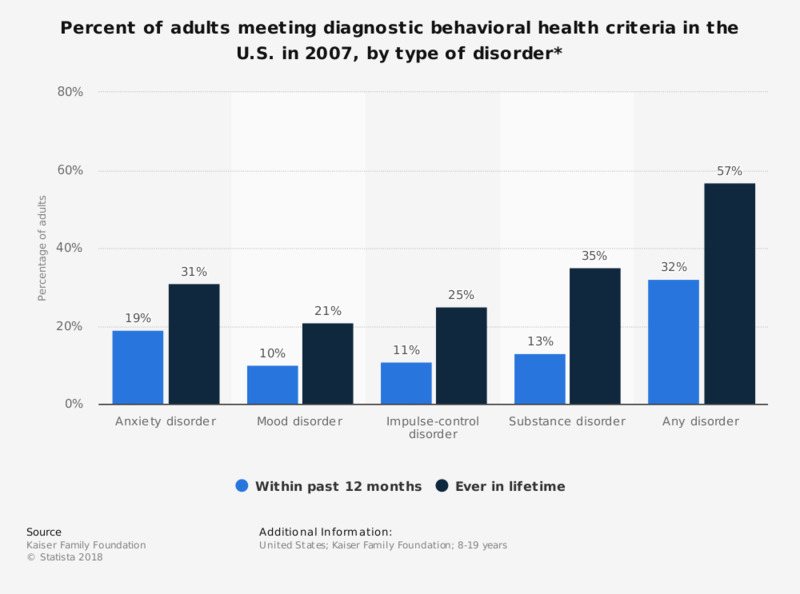 This statistic represents the percentage of adults meeting diagnostic behavioral health criteria in the United States, in 2007. In that year, 19 percent of the U.S. adults were diagnosed with an anxiety disorder within the past 12 months, while 31 percent met the diagnostic behavioral health criteria in their lifetime. * Anxiety disorder includes panic disorder, agoraphobia, specific phobia, social phobia, generalized anxiety disorder, post-traumatic stress disorder, obsessive compulsive disorder, and adult separation anxiety disorder. Impulse-control disorder includes oppositional defiant disorder, conduct disorder, attention deficit/hyperactivity disorder, and intermittent explosive disorder. Substance disorder includes alcohol abuse, drug abuse, and nicotine dependence.